Often, there are two types of percentages that one needs to calculate in Excel. Calculating the percentage as a proportion of a specified value (for example, if you eat 4 out of 5 mangoes, what percentage of mangoes have you eaten). Calculating the percentage change (YoY or MoM). This is usually used in sales reporting where the manager would want to know what’s the sales growth Year on Year, or Quarter on Quarter. How to Calculate Percentage as a Proportion in Excel. How to Calculate Percentage Change in Excel. 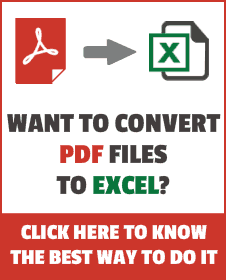 How to Format Cells with Percentages in Excel. Examples of this would be to find sales coverage or project completion status. For example, your sales manager may want to know what percentage of the total prospective customers can be reached effectively in a region. This is known as the sales coverage. Based on this, he/she can work on the sales coverage model and/or channels to reach more customers. Looking at the example above, it would be instantly clear that the coverage is lowest in Region C, where the manager may plan some new initiatives or campaigns. Within Excel, you can enter =B3/B2 to calculate the percentage for Region A. Note that this would give a value in General/Number format and not in the percentage format. To make it look like a percentage, you need to apply the percentage format (shown later in this tutorial). Percentage change is widely used and monitored in various areas of business. Analysts usually talk about a company’s Revenue growth or Profit growth in percentage. Companies often track percentage change in costs on a monthly/quarterly basis. Column D has the YoY percentage change value for Revenue, Cost, and Profit. It can be easily deduced that the revenue growth was healthy but costs grew at a staggering 86.1% and lead to a decline in profits. Again, note that this would give a value in General/Number format and not in the percentage format. To make it look like a percentage, you need to apply the percentage format (shown later in this tutorial). So let’s see how to apply the percentage formatting in Excel. 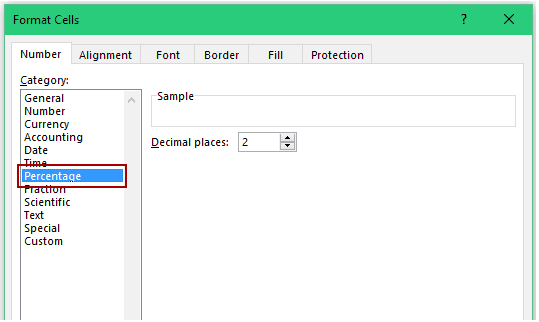 Using the Number Format Cells Dialog Box. Use the keyboard shortcut – Control + Shift + % (hold the Control and Shift keys and then press the % key). Note that this applies the percentage format with no decimal places. So if you use it on 0.22587, it will make it 23%. Select the cell (or the range of cells). Go to Home –> Number –> Percent Style. If you want to have the percentage value to have decimals as well, you can use the increase decimal icon right next to the percentage icon in the ribbon. Using the Format Cells Dialog box gives a lot of flexibility to the user when it comes to formatting. Select the cell (range of cells). Go to Home –> Number and click on the dialog launcher (a tilted arrow icon at the bottom right of the group). This will open the Format Cell dialog box. You can also use the keyboard shortcut – Control + 1 (hold the control key and press 1). In the Format Cells dialog box, within the Number tab, select Percentage in the Category list. If you want to change the number of decimal places to be displayed, use the Decimal places option on the right. For example, if you want to display the value with 2 decimal places, make it 2. How to Calculate CAGR in Excel.